Sorry, we are currently sold out of 'Apples & Oranges Deluxe'. Please check back later. Bring health and good wishes with every Expressregalo Fruit Crate filled with delicious and sun-kissed fresh Dole fruits. 8 is believed to be the luckiest number in Chinese culture so send our 8+8 crate for fortune and good luck. Each set simply includes 8 apples & 8 oranges. Our pine wood accented custom wooden gift crate is 5x10x14 inches. It's designed to be kept and reused for storing and organizing items at work or home. Send your gifts anywhere in the Philippines with expressregalo.com. All orders placed before 4:00 PM between Sundays to Fridays, Manila time, will be processed on the same day. Items ordered after these cut-off time will be processed the next working day. Processing and delivery of all items received on Sundays and non-working holidays will be attended to the next working day. We do not have Sunday deliveries for fresh flowers but we suggest that you schedule your delivery date a day ahead which is a Saturday. Our regular delivery hours are from 11:00 AM to 5:00 PM from Mondays to Saturdays. This sometimes may extend to 7:00 PM onwards depending on the number of deliveries for the day. Please note that we cannot accommodate time-specific deliveries since we only outsource our couriers. Due to the nature of the product for ordered flowers, www.expressregalo.com has the right to replace colors depending on stock availability. We want your gift to reach its destination on the day you specified however, there are some areas that take 2 – 3 days of transit time especially during peak seasons. To avoid delays, we suggest that you place your order 2 - 3 days prior to your desired delivery date. 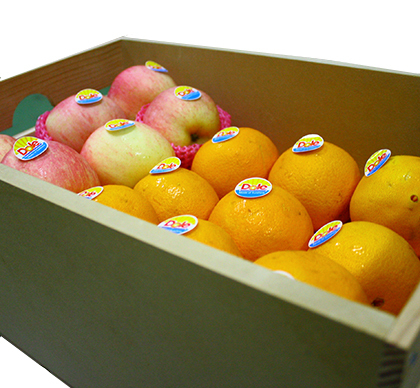 All our Dole fruits are carefully selected to its freshness. They are packed almost at its ripe stage so it will arrive to its destination almost set for enjoyment by the recipient. Some fruits are individually cushioned with a styrofoam net wrapper to prevent from being bruised. The fruits are nicely displayed in a stylish palo china wooden crate and sealed with a cling wrap plastic to preserve its natural flavors. Lastly, the crate is placed in a smart, sturdy shipping box for added protection during transport. Your package comes with a special greeting card, that can accommodate up to 50 words, which you can personally convey your deepest feelings to your recipient. Copyright © 2018 Express Regalo is a registered trademark of The Philippine Cut Flower Corporation.